Hastert uses federal tax dollars to turn $1.5 million profit for himself. Bush stymies Abramoff investigation by firing US Attorney handling the case. Pat Robertson calls for the assassination of Venezuelan president Hugo Chavez. 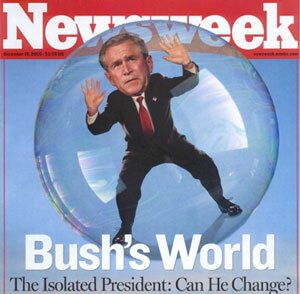 Hurricane Katrina strikes Gulf Coast; Bush administration response lackadaisical and incompetent. August 2: A newly released National Intelligence Estimate (NIE)concludes that Iran is about ten years away from being able to make nuclear weapons. The Bush administration has said that Iran is no more than five years from such capabilities, and Bush officials have frequently warned Americans of the threat represented by the supposedly imminent prospect of a nuclear-armed Iran. Like all NIEs, this report represents a consensus of the entire US intelligence community. The NIE is cautious, saying that while the intelligence community is certain Iran's military is engaged in some sorts of clandestine activities, it cannot say that any of those activities are related to the creation of nuclear weapons. Still, a senior intelligence official familiar with the findings says that "it is the judgment of the intelligence community that, left to its own devices, Iran is determined to build nuclear weapons." The White House has never used any intelligence assessments to back up its claims about an imminently nuclear Iran. Instead, it has pointed to years of Iranian concealment, and asked why Iran needs nuclear power plants considering the amount of oil it possesses. This is the first NIE on Iran since 2001; more recent assessments produced during Bush's tenure were far more narrow in scope, and were sometimes rejected by hardliners unhappy with the intelligence community's previous findings. In 2002, then-deputy national security advisor Stephen Hadley commissioned an assessment of "regime change" in Iran. That assessment portrayed Iran as a nation slowly moving towards democracy, and cautioned that US interference would possibly derail that process. Many in the administration were not happy with those findings. Until recently, Iran was judged, as exemplified by February 2005 testimony from Vice Admiral Lowell Jacoby, the director of the Defense Intelligence Agency, as being within five years of having the ability to make a nuclear weapon. But since 1995, the government has continually made that same five-year estimate. Now, according to the NIE, Iran will be unable to produce a sufficient quantity of enriched weapons-grade uranium before "early to mid-next decade," closer to the year 2015. The report does not say whether Iran would have a delivery system ready if and when it manufactures enough uranium. And the ten-year estimate is a minimum, assuming that Iran will pursue a nuclear weapons program as quickly as possible. The report does not take into account that Iran has suspended much of its uranium-enrichment work as part of a tentative deal with Britain, France and Germany. August 8: A US grand jury investigation in Guam into the criminal actions of Republican lobbyist Jack Abramoff was terminated over two years ago when Bush had the supervising federal prosecutor removed. The investigation went nowhere for years afterwards. The Guam investigation was separate from the federal grand jury in the District of Colombia that is investigating allegations that Abramoff bilked Indian tribes out of millions of dollars. In Guam, a US territory in the Pacific, investigators were looking into Abramoff's secret arrangement with Superior Court officials to lobby against a court reform bill then pending in Congress. The legislation, since approved, gave the Guam Supreme Court authority over the Superior Court. In 2002, Abramoff was retained by the Superior Court in what was an unusual arrangement for a public agency. In May, Abramoff was paid with a series of $9,000 checks funneled through a Laguna Beach, California, lawyer to disguise the lobbyist's role working for the Guam court. No separate contract was authorized for Abramoff's work. Guam court officials have never explained the contractual arrangement. At the time, Abramoff was a well-known lobbying figure in the Pacific islands because of his work for the Commonwealth of the Northern Mariana Islands and Saipan garment manufacturers, accused of employing workers in what critics called sweatshop conditions. The transactions were the target of a grand jury subpoena issued Nov. 18, 2002, according to the subpoena. It demanded that Anthony Sanchez, administrative director of the Guam Superior Court, turn over all records involving the lobbying contract, including bills and payments. Instead, the chief prosecutor, US Attorney Frederick Black, was suddenly and inexplicably demoted. Black was a well-respected prosecutor who, though he was officially on temporary status, had served in the post for over a decade after being named to the post by the elder Bush. At the time he was replaced, Black was directing a long-term investigation into allegations of public corruption in the administration of then-Governor Carl Gutierrez. The probe produced numerous indictments, including some of the governor's political associates and top aides. Gutierrez and his supporters fiercely lobbied the White House for Black's removal or demotion. August 29: Hurricane Katrina, a devastating Category 4 storm, strikes the Gulf Coast near New Orleans. The immediate response from the federal government is lackdaisical, confused, careless, and tragic, costing innumerable lives and untold suffering in the wake of the devastation. An entire page of this site is dedicated to Katrina, its prelude, and its aftermath. Politically, the White House's response is baffling for Republicans desperate to see Bush show some leadership during the crisis. Political handler Karl Rove, fresh from mismanaging the administration's push to privatize Social Security, tries to squeeze a photo op out of the crisis, circulating a photo of Bush looking at the damage from the air. 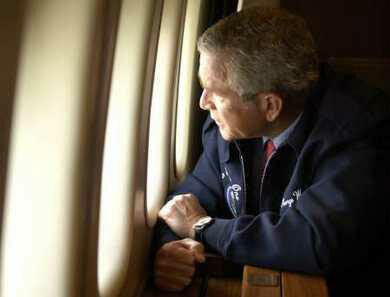 Authors James Moore and Wayne Slater write, "The photo of Bush gazing out the window in the gentle half-light, amid the security and considerable comfort of Air Force One, peering down on a city lost and ruined and rapidly descending into chaos, dominated the front pages the next morning. It was among the most damaging photos of his presidency. The president appeared detached and powerless, unable even to comprehend how he might use the government to help his own people. Worse, the picture conveyed no sense that the president cared or was worried about the catastrophe unfolding beneath the aircraft's big wings." Republican pollster Matthew Dowd frantically tries to get some sort of response from Rove, peppering him with text messages and e-mails asking why was any kind of response taking so long, why does the White House seem so slow-footed? Finally, Rove quits responding entirely, and Dowd pounds out the following message: "Who's in charge? WHO'S IN CHARGE?" Dowd receives no answer. "I guess I pissed him off," Dowd later says. Instead of responding quickly and compassionately to the crisis, Bush and his aides spend the first 48 hours arguing over who would be in charge: the Pentagon, FEMA, or the National Guard, which is under the control of individual governors. Louisiana has a Democratic governor, Kathleen Blanco, and the idea of having a Democrat in the position of showing any leadership is anathema to White House aides. Lawyers for the Justice Department and the Pentagon find themselves squabbling over whether or not to federalize the National Guard. Defense Secretary Donald Rumsfeld refuses to allow active-duty troops to be dispatched to act as de facto police officers. Questions of legal liability, states' rights, and how to answer the crisis without giving Democrats the chance to garner any positive publicity dominate the discussion, nothing gets done in Washington, and state and local authorities are left to their own devices without any leadership or input from the federal government. The tone-deafness of Bush and his senior advisors is appalling, best exemplified by Bush's friendly endorsement of FEMA's hysterically incompetent head, Michael Brown -- "Heck of a job, Brownie" -- his odd, rambling observations about the fun he had in his youth partying in New Orleans, and his hope that millionaire Republican senator Trent Lott can soon rebuild the house he lost in the storm. Bush's entire response process seems out-of-touch, casting further doubts on Karl Rove's ability to successfully manage his president's public relations. Bush's remarks "sound more than clumsy," Moore and Slater write, "they sound oblivious." A matching flood of criticism of the Bush administration, and the clueless president giggling during disaster overwhelms the White House, leaving Rove and his top aides floundering and adrift. Rove tries to fight back, dispatching White House communications director Dan Bartlett -- another political appointee with no experience in dealing with natural disasters -- to draw up a public relations plan to send cabinet members to storm-ravaged communities and to have Bush return repeatedly to the Gulf Coast. Uncharacteristically, Rove directs White House members not to respond to Democratic attacks, worrying that to respond would make the White House look politically partisan at a time of crisis. But underlying his restraint is a typically partisan agenda -- to shift the blame for the failure of response away from the White House and onto the Democrats in Louisiana, particularly Blanco and New Orleans mayor Ray Nagin. Homeland Security chief Michael Chertoff, himself criminally oblivious during the aftermath of the hurricane, tells NBC's Tim Russert on September 4 that the state and local authorities are to blame for the horrendous response: "The responsibility and power, the authority to order an evacuation rests with state and local officials. The federal government comes in and supports those officials." The counteroffensive is on. Reliable Republican agitator Grover Norquist leads the charge, blaming the chaos in New Orleans on "the looting in a Democratic city run by a Democratic mayor and a Democratic governor." Rove and Bartlett tell their sockpuppets on conservative talk radio to mount accusations that Nagin failed to commandeer hundreds of school buses to evacuate people, a charge quickly disseminated by Rush Limbaugh and Laura Ingraham, among others. Bill O'Reilly brings the specious charges to his Fox News television talk show, blaming Nagin and Blanco for the failure to evacuate tens of thousands of New Orleans residents and glossing over the federal government's failure to respond. Fox's Sean Hannity accuses Nagin of "throw[ing] temper tantrums" instead of evacuating the citizens. While the Republican communications infrastructure finds itself completely unable -- by temperament as well as by competence -- to do anything productive about Katrina's devastation, it well knows how to launch attacks and smear campaigns. But the attempt to smear Democrats, though somewhat effective, has little real impact. The main political damage is to Bush himself. The picture of Bush as a strong, effective leader capable of protecting his country is shattered. The invasive budget cuts that have crippled federal agencies such as FEMA, as well as the rampant cronyism and GOP-led profiteering, all comes under renewed scrutiny. In the days after the hurricane and the media onslaught of criticism, Bush is visibly angry -- not about the unrelieved suffering of the Gulf Coast citizens, but at the perception that the blame for the failure of response should land on him and his administration. He is angry that the media is saying that if the response to Katrina is any judge of how his administration would respond to another 9/11-style terrorist attack, then that response would be equally inept and callous. The damage to the administration is myriad -- Bush's leadership is now in question, the government is facing billions of dollars in expenditures that will drive up the deficit and further antagonize the GOP's fiscal conservatives, and mainstream media reporters and commentators once solidly in Bush's pocket are now daring to criticize him on the airwaves. And Rove's plan to woo minority voters to the GOP has taken a hit. The resounding perception that Bush let the poor, largely black citizens of New Orleans suffer without succor, voiced by rapper Kanye West in his accusation that "Bush doesn't care about black people," has done incalculable damage to Rove's attempts to recruit minority voters to the ranks of the Republican Party. Rove's campaign strategies had seen a small but important rise in the numbers of black voters for Bush, from 9% in 2000 to 11% in 2004, largely by strategic use of anti-abortion and anti-gay rhetoric. Republican accusations that Democrats, not Republicans, founded and still support white supremacist organizations like the Ku Klux Klan are now falling on deaf ears. After Katrina, Bush's support among African-Americans plummets to 2%. They feel, rightly enough, that race played a strong factor in the Bush administration's failure to respond to Katrina; the haunting visuals of blacks on the roof of New Orleans's Superdome and floating face-down in floodwaters give the truth to their beliefs. And another of Bush's strengths -- loyalty to his subordinates -- is now backfiring. What was once touted as loyalty is, in the aftermath of the Michael Brown debacle, looking more like arrant cronyism. Undeserving Bush loyalists like Brown have long infested Washington, but now the media, and the American people, want to know who they are and, if need be, ferret them out before the next crisis. Questions about the incompetence and cronyism surrounding the Iraq occupation are raised and renewed. "The shiny MBA presidency with all its metrics and efficiency had assumed the creaky look of Tammany Hall," Moore and Slater write, "which only fed public doubts and deepened Bush's problems in what had become a horrible September." Longtime Bush ally Don Sipple says simply, "They've lost their mojo." Sipple has feared such a backlash for some time, but not so much for political reasons as psychological. "A good deal of motivation on the part of this president was to avenge his father's failed presidency," Sipple later says. "His definition of a failed presidency is the failure to get re-elected, okay? I know that was a strong motivator for him from the first time I met him. And so if you're out to avenge your father's presidency, everything goes into re-election, because that's the tipping point. It's almost as if the whole predicate for his presidency was re-election, ahead of any agenda or anything." Sipple muses, "The failure of his presidency began shortly after his re-election. It was almost like that's what he was there for, and now he's on autopilot or sleepwalking. I think that's a partial explanation for the lack of vigilance and planning, of thinking ahead."